The very first time I saw a picture of Jess Hutch's Robot pattern, I knew I had to make it for Alaina. Though it was late for her birthday this year, I did manage to finish it in time for she and Anil to come and visit us a couple of weeks ago. She liked it -- and we were so happy to so them! It was bitterly cold the weekend they visited, and since the've just moved back to the East Coast Anil did not have a good enough hat. I grabbed some leftover worsted-weight yarn, and did what I could to rectify that situation. By the time they left for New York at the end of the weekend, they had a pair of handknits to take with them. Anil , his hat, and the robot. cool robot, and sweet hat! Don't you love how fast you can whip one of those up?? That is the cutest picture EVER. Love the robot! The robot and the hat came out great! 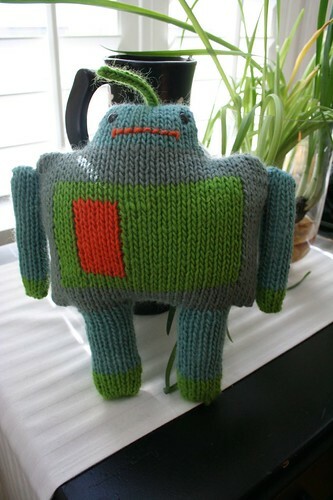 love the robot.......where can i find the pattern?? �Me podr�as decir la direcci�n de alguna tienda de lanas en New York, concretamente de Manhattan? Gracias.